Global Coalition for Lake Tana Restoration (. An airboat is a flat-bottom vessel propelled by an aircraft type propeller to push the air behind, attached at the back of the boat. Since there are no operating parts beneath the water together with the flat bottom, this allows the airboat to smoothly glide on shallow waters as well as in swamplands. Since a significant proportion of the water hyacinth is located at a shallow depth of Lake Tana, with a dense mat, it is not navigable with a standard boat. In places like this, airboats are the efficient way to travel on shallow and dense mats of water hyacinth in Lake Tana. Airboats are often used for monitoring of the water hyacinth and to apply biological control. 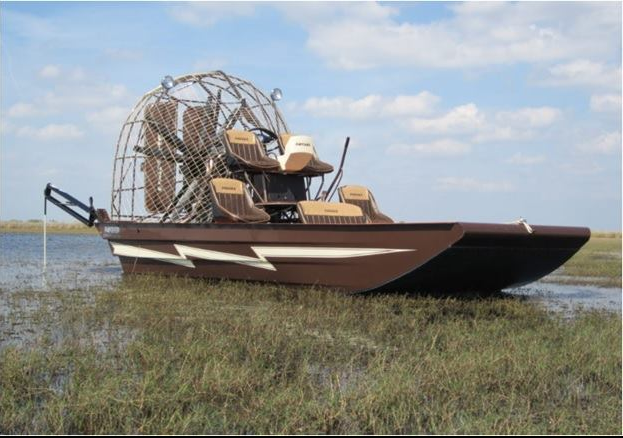 The GCLTR is also negotiating with the factory to modify the airboat to attach a harvesting rake to collect the weed from shallow waters to the shores of the lake.